The end is finally in sight for that time of year affectionately known as “Winter Blahs.” And if you’ve been squandering a lot of work hours on Google Flights looking for somewhere, anywhere, to go that's warmer than where you currently are, we are happy to assist you. 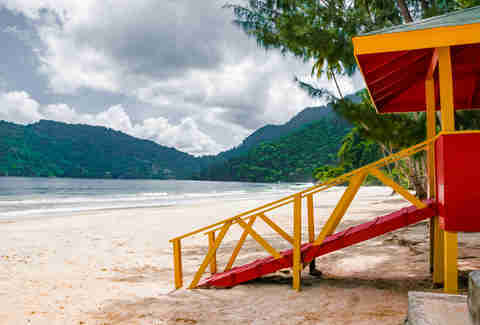 The fastest route to paradise, especially for East Coasters and Midwesterners, is usually a quick jaunt to a Caribbean beach. 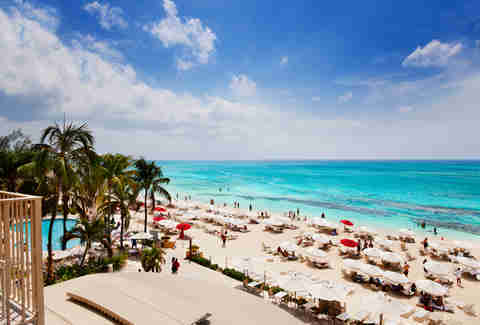 White sand, turquoise water, jealous Instagram followers -- what more could you ask for? But which beach is right for you? These 18 are, in our humble opinion, the best Caribbean beaches to check out right now. 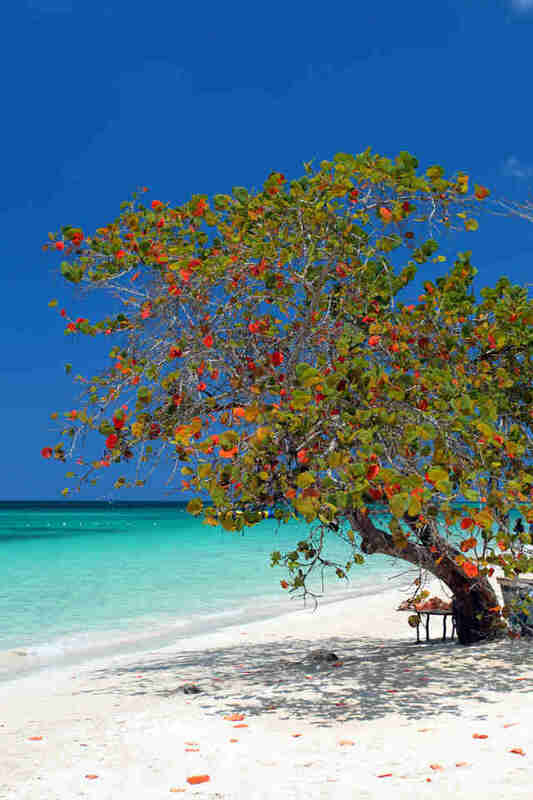 Why it made our list: Thanks to the embargo (or no thanks, depending on how you look at it), Cuban resort towns boast the same fine white sand beaches and clear waters as other Caribbean destinations, but with fewer people and a more authentic feel. The best in Cuba is Varadero, where the 10-mile beach is lined with over 20 hotels that cost a fraction of what similar resorts on other islands would. Bonus: Just off the beach is a chain of untouched keys with explorable caves; you can visit via a short boat ride. 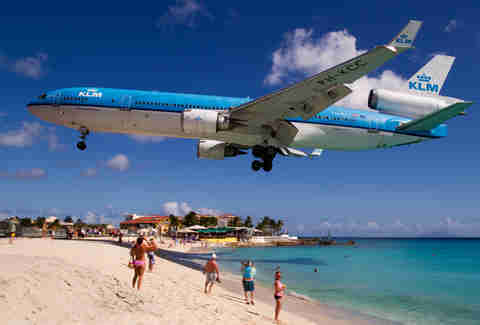 Why it made our list: It’s the beach where planes take off and land right over your head, and where you can hold onto a fence and see how long you can withstand the engine thrust of an A330. This non-traditional beauty will give you some surreal pictures and a unique-in-the-world experience. Bonus: There are two bars on either side of the beach, and at Sunset Beach Bar they post the times of plane takeoffs and landings so you can plan your time in the water accordingly. Why it made our list: It’s one of the 25 most beautiful beaches in the world to start with. 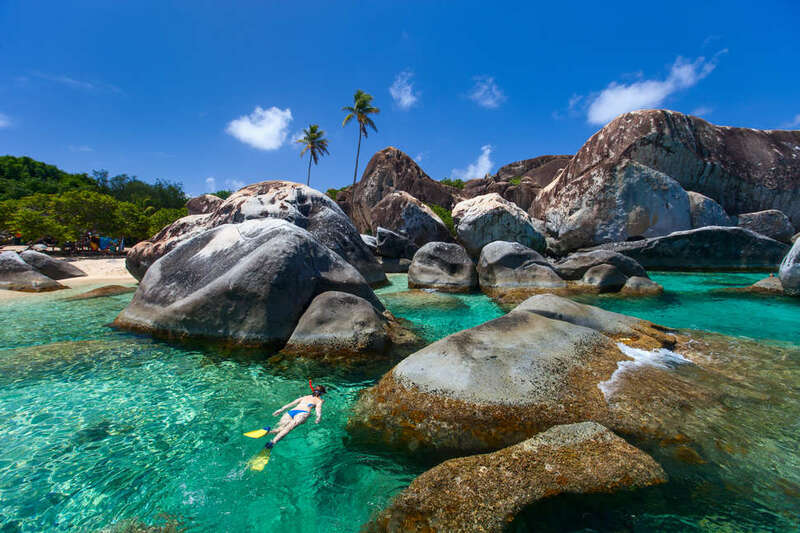 But in the British Virgin Islands, it’s also the beach with the easiest access to bars, restaurants, and other activities you'll want to engage in when lying on perfect white sand gets old. 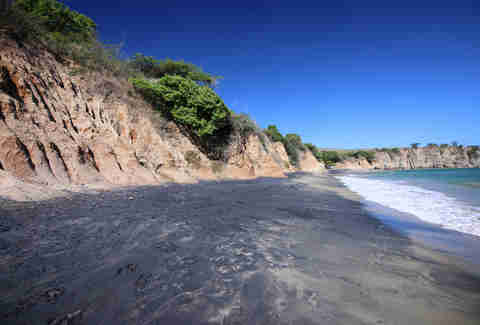 Why it made our list: It’s hidden, remote (you’ve gotta hike through unmarked wilderness and cross a stream to get there) and, oh yeah, it’s a freaking black sand beach in decidedly un-volcanic Puerto Rico. Bonus: Hit up Richard’s Bake & Shark to try Trinidad and Tobago's national dish, the, well, bake and shark. Yep, it’s deep-fried shark stuffed in deep-fried dough, and it's a totally good-for-you cultural experience. Why it made our list: Not that Saint Croix is exactly overcrowded and full of tourists, but if you REALLY want the “alone on a desert island” experience, head to this national preserve 30 minutes by boat from mainland Saint Croix. It’s one of the top snorkeling spots in the world, and if the weather and visibility are right you can snorkel around the reef that surrounds the island. Bonus: The 2017 hurricane season dumped a ton of sand on the island’s northwest shoreline and created a new, even MORE remote beach that even previous visitors to Buck Island don’t know about. 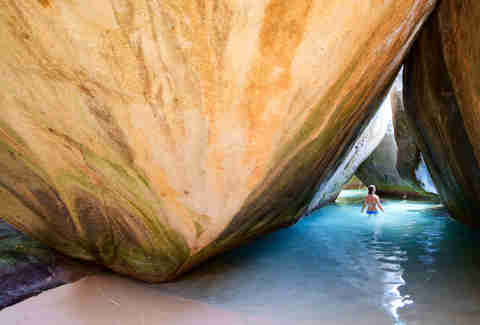 Bonus: If giant boulders aren’t your idea of a perfect beach, it’s only a short (and pretty spectacular) hike through The Baths National Park to the beaches of Devil's Bay and Spring Bay; both of which are more the white-sand-and-blue-water variety. 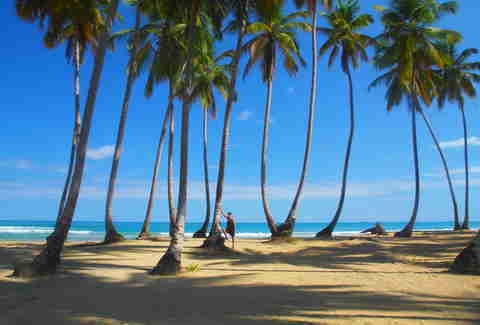 Why it made our list: We've already told you that the best beaches in the DR are in the not-nearly-as-blown-up north, and of those, the cream of the crop are in the former fishing village of Las Terrenas. And then, the most isolated and dramatic of THOSE beaches is the one locals call "El Coson." So think of this stretch of sand as the best of the best of the best. Bonus: Sure, you CAN make the long walk through the beachside jungle from the town of Las Terrenas. But wouldn’t it be more fun (and faster) to jungle-hop on an ATV? Of course it would, and you can totally do that here. Why it made our list: A long beach that was pretty much founded by hippies so they had a place to get high and stare at far-out tropical sunsets, it's now home to the world’s preeminent swingers resort, Hedonism II. 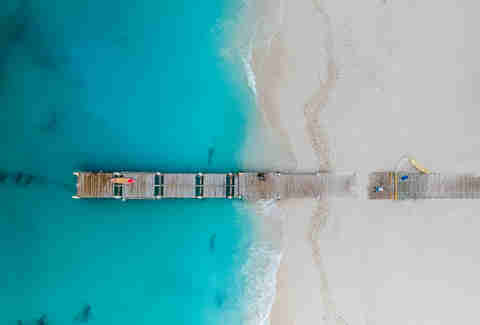 Why it made our list: To be honest, you could pretty much put any beach in Turks and Caicos on a list of the best in the Caribbean, but the turquoise-water star of this island chain is Grace Bay. Home to most of the major resorts in Providenciales, it's also a launch site for the best diving in the islands. Bonus: If lying on the beach makes you antsy and you’re NOT scuba certified, head to the Coral Gardens snorkeling park -- you’ll see marine life just as amazing as that 80ft down. Bonus: Except... when the cruise ships are docked in St. Thomas. Also known as: the time you don't want to be there. 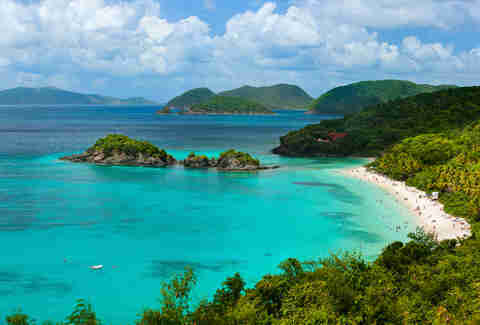 Hundreds of tourists take the ferry to St. John and the beach at Trunk Bay gets crowded. On a “no ships” day, though, it's quiet and the snorkeling trail is easier to explore. Consider yourself warned. 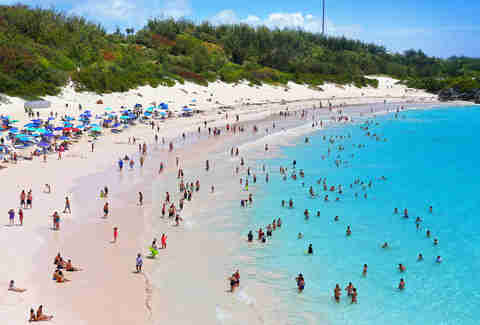 Why it made our list: Yes, yes, we realize that Bermuda isn't technically in the Caribbean but close enough, right? And the combination of pink sand and limestone formations is something you won’t see anywhere else. Why it made our list: It’s a 2-mile stretch of fine white sand set against perfect turquoise waters, the most popular beach in Grenada that nonetheless doesn’t feel overcrowded. It’s also lined with plenty of beach bars and restaurants so you can grab a drink in the shade if the sun gets too hot. Why it made our list: Think of it as a calmer, more accessible version of its similarly named cousin in Jamaica. 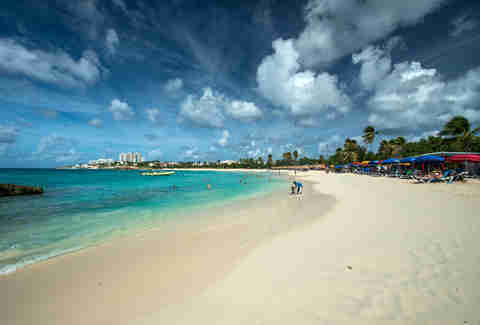 It stretches from the capitol in Georgetown up through luxury hotels and into residential parts of the island. So if you want to experience all the shiny sand and clear water, you don’t need to be staying at one of the fancy resorts. Bonus: In May, Cayman’s version of Carnival called Botabanno marches the length of the street parallel to the beach, so you can join the parade then run for a quick dip in the Caribbean. 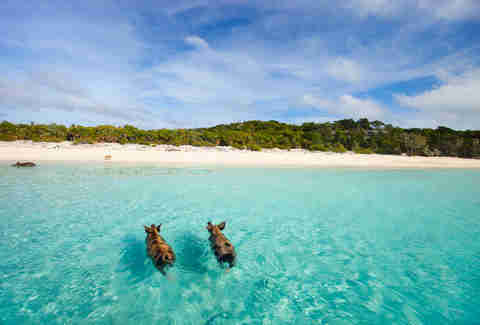 Why it made our list: Though it’s only a short drive from the airplanes at Maho Beach, it feels a world away. 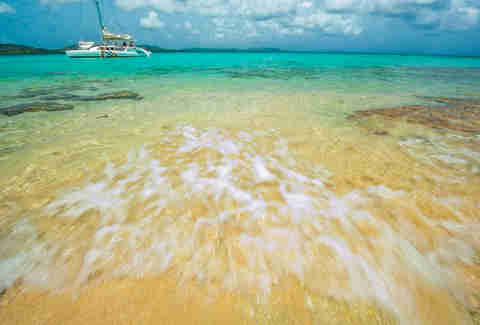 Once you’ve gotten your fill of sand, go amble through the rough coral formations that jut out from the beach. They form a collection of private grottos that make for some spectacular photo backdrops and scenic nature walks. Bonus: The beach is less than five minutes from the airport, and makes for the perfect last-day activity if you want to avoid the crowds and noise of Maho Beach. Why it made our list: Unless you go during one of the biggest New Year’s parties on the planet, this scenic stretch of white sand and funky beach bars is usually fairly empty. 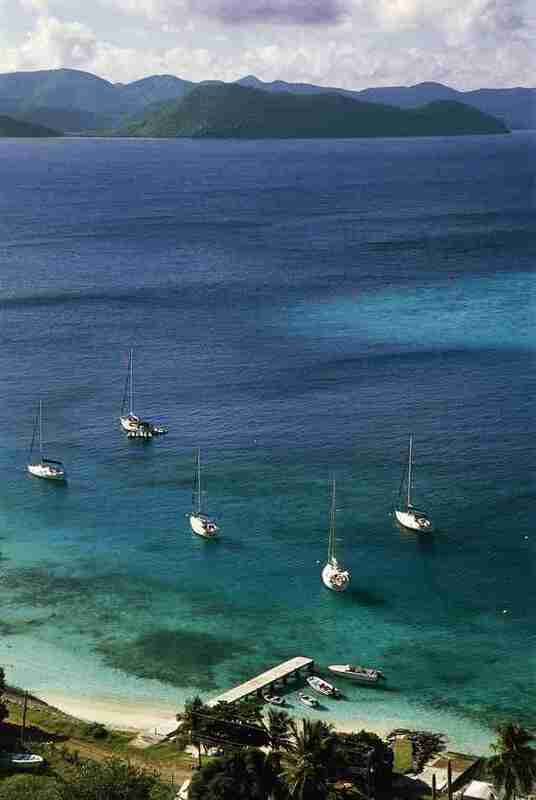 Set against the dramatic green hills at Jost Van Dyke, it’s a staggering bit of natural beauty that’ll have you ignoring the drinks until you’ve fully grasped where you are. Then again, with the easiest beach access to bars, restaurants, and other activities, that won’t last too long. Bonus: One of those bars is the Soggy Dollar, where the Painkiller was invented. 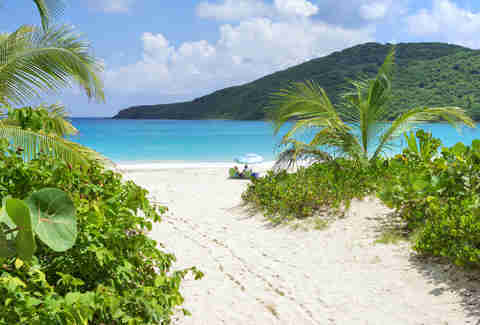 Why it made our list: Culebra island, where this gorgeous stretch of sand lies, might be the one part of Puerto Rico that tourism hasn’t taken over, a stretch of tropical beaches that feel completely removed from civilization, where nothing but you, the sand, and a grove of palm trees populate the beach. Those, and the odd sea turtle that wanders up on the shore or stray decommissioned army tank. 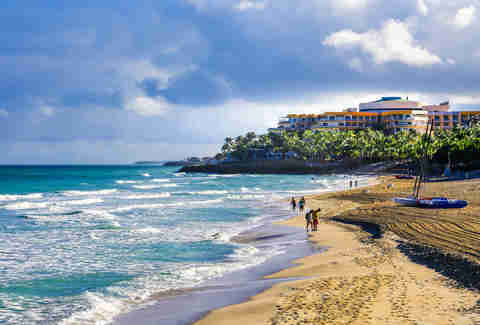 Bonus: Several full-day boat cruises leave from mainland Puerto Rico that allow you to visit multiple beaches on this island. Go during the week and you won’t find another soul there. Why it made our list: The sprawling desertscapes of Aruba may not be for everyone, but it’s hard to argue with the beauty of Eagle Beach. The most popular beach on the island boasts some of the prettiest sunsets in the Caribbean, as the sun basks off the desert hills in the background and the white sand strikes a perfect contrast against the calm blue water. 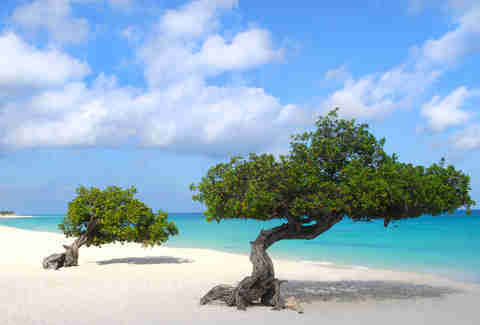 Bonus: Eagle Beach is also home to the famous bending fofoti trees, probably the most recognizable image of the island. Matt Meltzer is a staff writer at Thrillist and learned more about life from a Horseshoe Bay snorkel salesman named Vaughan than he learned in four years of college. Follow his Caribbean adventures on Instagram: @meltrez1.